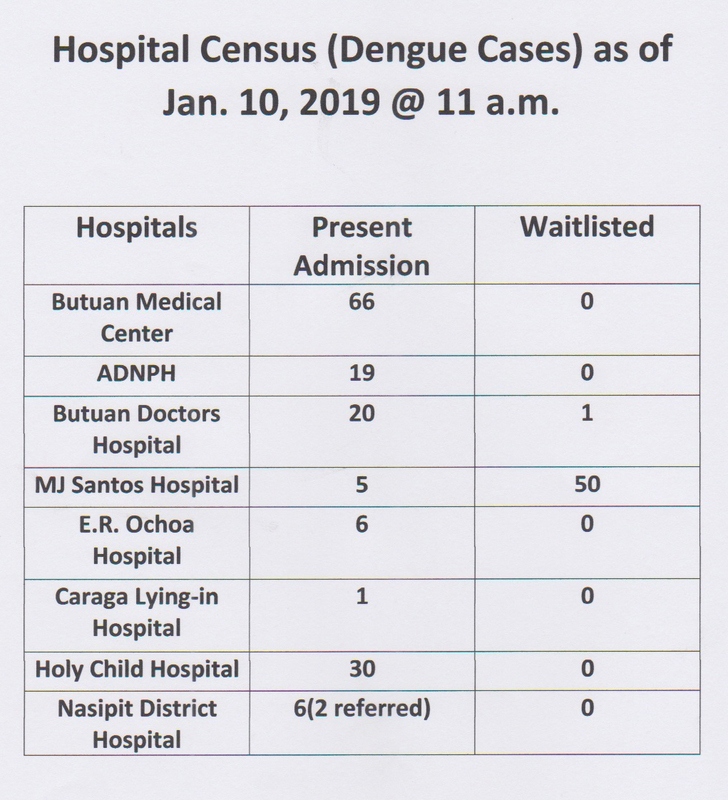 BUTUAN CITY, Jan. 16 (PIA) – With the significant increase of dengue cases in Caraga region, Department of Health (DOH) Caraga regional director Dr. Jose R. Llacuna, Jr. urges the communities especially barangay councils to help combat dengue. 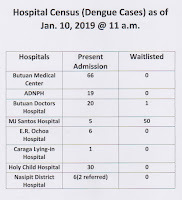 As per data from DOH Caraga as of January 10, 2019, 11:00 a.m., a total of 153 patients with suspected dengue have been confined in the different hospitals of Butuan City and Agusan del Norte, majority of which are admitted at the Butuan Medical Center in Butuan City. In a statement from Dr. Llacuna, during a press conference held recently in Butuan City, he is asking the community to lead an intensified 4S campaign. 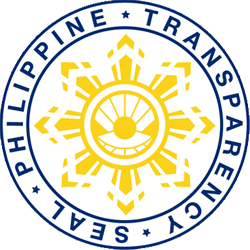 The 4S campaign, he said, includes Search and Destroy, Use of Self Protection Measures, Seek Early Consultation and Saying No to indiscriminate fogging campaign in their barangays. Llacuna also said that in the case of the increasing dengue cases in the region, the DOH Center for Health has extended the Code White Alert from January 4 up to February 14 in an effort to decrease the number of dengue cases. “Dengue fast lanes have been implemented in all different hospitals in the region to give chance for those who are being suspected of dengue especially the referral cases from the rural health units to be given priority in the DOH and other health facilities,” Llacuna said. 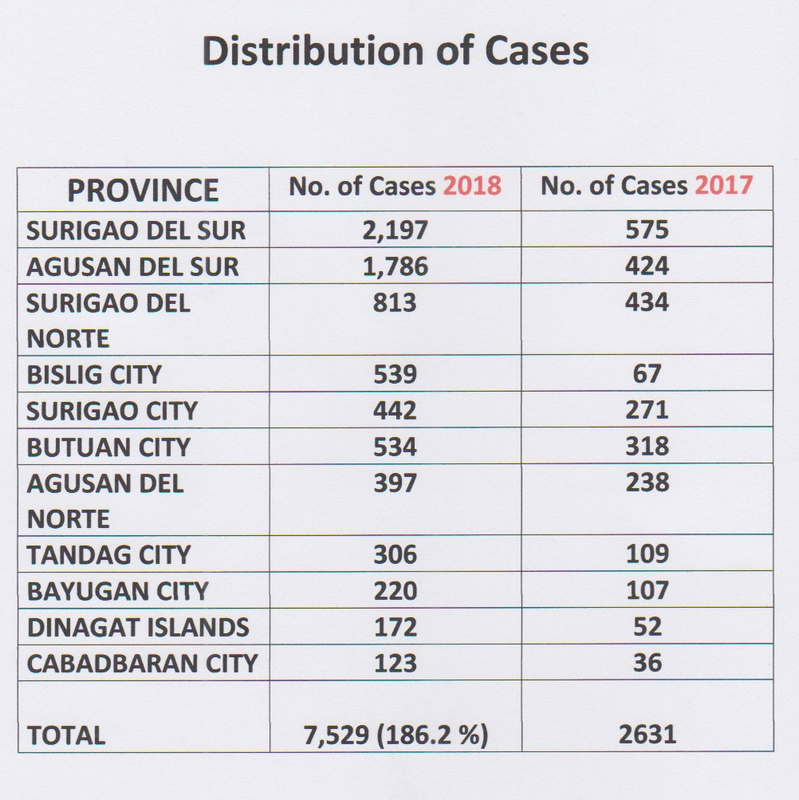 For the year 2018, a total of 7,529 suspected cases have been reported to the Regional Epidemiology and Surveillance Unit, this is 186.2 percent higher compared to the 2,631 total cases in the year 2017. 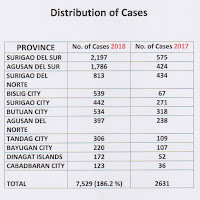 Among the provinces and cities, majority of the cases came from Surigao del Sur with 2,197 and Bislig City with 539. 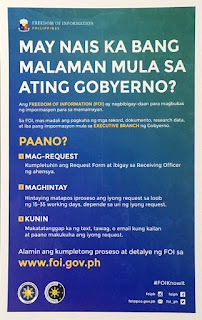 Hot spot barangays identified in the region include: Taglatawan and Poblacion of Bayugan City, Agusan del Sur; Doongan, Ambago, Barangay 21 of Poblacion, Mahogany and Libertad in Butuan City; Doyos of Carrascal, Surigao del Sur; Tagasaka, La Casa Poblacion and Roxas of Hinatuan and Sabang of Lingig in Surigao del Sur; and Rizal in Surigao City, Surigao del Norte. “In times like these, responsibility towards protecting the community falls on the shoulders of every member of the community. Collective effort and unity are needed to combat dengue disease," Lacuna said. SIBAGAT, Agusan del Sur, Jan. 16 – The local government unit of Sibagat of this province has declared the Communist Party of the Philippines-New Peoples Army (CPP-NPA) terrorist as persona non grata through a Municipal Resolution Number 137-18 dated Dec. 21, 2018. Municipal Mayor Maria Liza L. Evangelista and all the members of the legislative council signed the resolution. The declaration was due to the raid of the NPA terrorist of the New Tubigon Patrol Base at dawn of Dec. 19, 2018, where they abducted the 12 CAFGU Active Auxiliaries (CAAs) and two soldiers, aside from carting away several firearms from the soldiers and CAAs. The abducted soldiers and CAAs were, later on, used as hostages by the CPP-NPAs while demanding ceasefire from the government. The resolution stated that “the incident made the families of the hostages in chaos leaving them psychologically and mentally disturbed." The LGU also sighted the demands of the families of abducted CAAs and soldiers for the unconditional release of their loved ones. BUTUAN CITY, Jan. 16 --The Police Regional Office (PRO) 13 topped, among the 17 police regional offices in the country, in the Crime Solution Efficiency (CSE) for the 4th quarter of 2018. According to Senior Supt. James T Goforth, Chief of the Regional Investigation and Detective Management Division, PRO13 garnered a rating of 86.19 percent followed by the National Capital Region Police Office with 86.07 percent as second and Police Regional Office4A with 79.32 percent as third. In the last three months of 2018, the total crime volume in the region reached 2,259 comprised of 406 index crimes and 1,853 non-index crimes. Out of 2,259 crime volume, 1,947 crime incidents were solved by the police units. Chief Supt Gilberto DC Cruz, PNP Caraga Director, thanked the community, other law enforcement agencies and all stakeholders that contributed in the crime solving efforts of the police force.